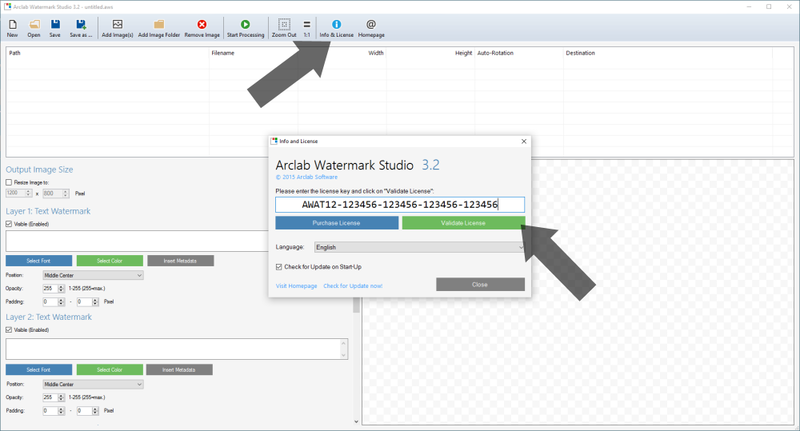 Arclab® Watermark Studio | F.A.Q. Can I use Watermark Studio on a Mac? Click on "Info & License", enter the license key and click on "Validate License". Please take a look at this page if your license key is not working. We recommend to create a transparent PNG image (32bit) using a graphic editor like e.g. GIMP. comment Can I use Watermark Studio on a Mac? Watermark Studio is a software program for Windows PC, it will not work on Mac OS. You can use it if you have a dual OS installation MacOS/Windows on your Mac. Click on "Start Processing" and select the output folder to start the processing. Important: The output folder should not be the same as the source folder. The program does not overwrite the source images, because the process is non reversible. Important: The program rebuilds the folder structure in the output folder, if you have selected (multiple) images using the tree view! The program shows a red X in the output log if it cannot save a file. The source images and the output images have the same path. There is no free space left on your hard disk. Solution: Clean you drive or use a different drive. The user has no permissions to write to the specified output folder. Solution: Run the program as administrator, use a different folder or change the folder permissions. The output folder is synchronized with a cloud service, which locks the files temporary. Solution: Close your cloud software or stop the synchronization temporarily.